June 5, 2018 By Jamie Leave a Comment By clicking on our links, we might make a SMALL commission - Thanks for the support! See our full DISCLOSURE here. Tired of hearing “Mo-om, what can I EAT? ?” I feel like in the summer time this is ESPECIALLY bad – how is it kids eat 10X more food in the summer than during the school year?? Whatever it is, they’re suddenly digging around for snacks constantly. 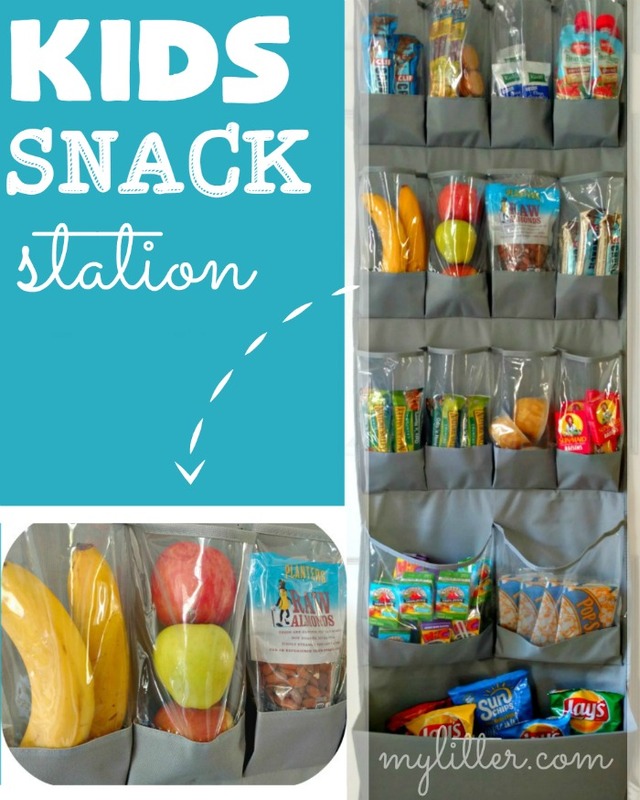 The good news is – this Kids Snack Station is going to make your life soooo much easier! And in the summer it’s just – oh – about every 45 minutes. 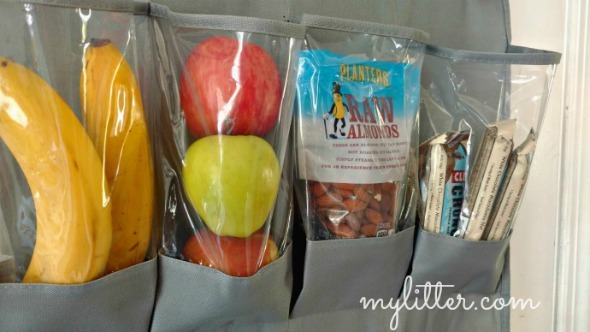 All you need to hold your snacks is a hanging shoe organizer with clear-front pockets like this one here. (Or mesh pockets like this one has work great too!) I got this one at Target – I like the extra big front pockets at the bottom for stashing chips and whatnot. 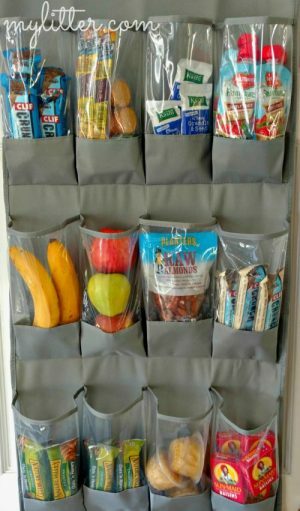 I put tons of healthy snack options in our organizer – including nuts, fruit, popcorn, Clif bars, fruit cups, applesauce and beef jerky. For some reason they seem more WAY excited to eat a banana or a fruit pouch when it comes out of a pocket (what’s up with that?). Since I took these pictures, they’ve cleaned out a couple of my pockets and I’ve already refilled them with bags of pretzels and little snack-portions of trail mix. It’s super easy to keep up with and it gives ME healthy options when I’m running out the door as well! 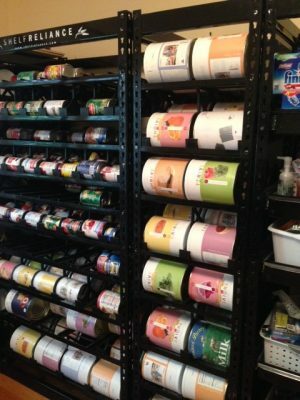 *Adapted from this build-your-own-lunch station we loved over on Hip2Save! 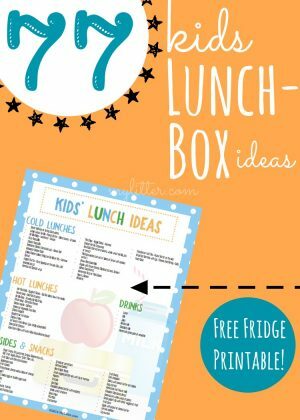 Kids Lunch Ideas + FREE Fridge Printable! 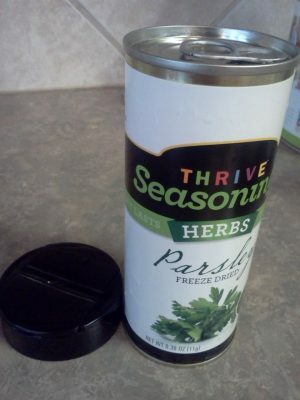 Food Storage Friday – Freeze Dried Herbs, How they save you money! May 3, 2013 By Tiffany 5 Comments By clicking on our links, we might make a SMALL commission - Thanks for the support! See our full DISCLOSURE here. Freeze dried does NOT mean more expensive. In fact, I have found that I have saved a lot of money by using freeze dried because there is so much less waste! I have been using TONS of the vegetables and the prep time and cost is less. You go to the store because you want to make some fresh salsa or guacamole. You pick up a very inexpensive handful of cilantro at $1.00/bunch. Cheap, right?! WRONG! How much of that cilantro are you REALLY using and how much are you throwing away? You probably use 1/4 of it or less, and the rest goes bad (and that’s if you’re making enough to feed a crowd) That $1 bunch of cilantro actually costs you $4 bunch because you threw 3/4 of it away! Would you really pay $4 a bunch EVER? Well you just did, and I do it all the time with fresh herbs. Freeze Dried Cilantro. It has the same flavor, texture, and nutrition as your fresh cilantro from the grocery store but it lasts, get this, 25 years sealed in the can and 1 year once it’s opened! How can this be? Well, it’s simple…. by taking the water out of the cilantro you’ve just increased its shelf life and reduced any chance of spoilage. Check out these cool cans – little metal spice cans to keep freshness in, pop-top lid, with an oxygen absorber inside to added freshness. Just pop the lid and use JUST what you NEED and put the rest on your shelf. You’ll be amazed at how fragrant, and flavorful these spice are. When was the last time you bought a dried oregano that actually SMELLED like Oregano? Maybe it smelled that way for just a few months and then, what… nothing! You’re literally putting a non-flavorful spice on your food just for the color, because you know as well as I do , that it doesn’t have that fresh flavor anymore. What a waste! 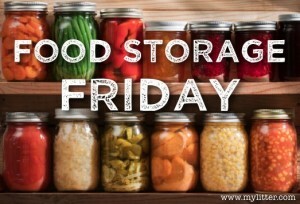 Go HERE for more information and to check out older Food storage Friday posts, go HERE. 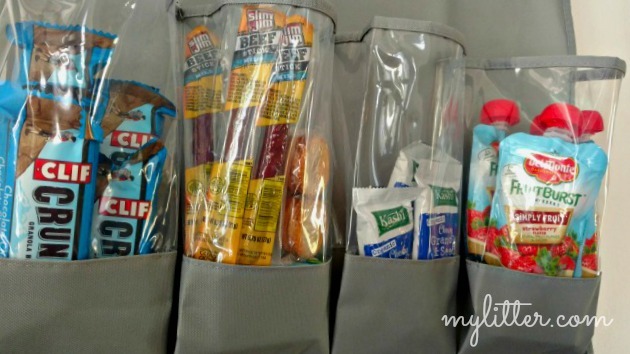 9 Weird things you can freeze ~ Food Storage Friday! March 26, 2010 By tiffany 7 Comments By clicking on our links, we might make a SMALL commission - Thanks for the support! See our full DISCLOSURE here. Thanks to Shasta for forwarding me this great article written by Jeff Yeager! I love to hear what other people are doing. It’s official: I’ve become my grandmother. I realized it the other morning when I opened the door to our freezer. ** This is Tiffany, I have also heard of people freezing kids stuffed toys to kill germs…. I am just saying…. March 12, 2010 By tiffany 14 Comments By clicking on our links, we might make a SMALL commission - Thanks for the support! See our full DISCLOSURE here. A friend of mine asked me to post what I store in my garage. I am NOT an expert on this at all, it is mostly trial and error. Who knew deoderant would melt?? Well, I do now! It was also nicely pointed out to me by a friend that I was killing my batteries by keeping them in the hot garage. Honestly, I had forgotten my basic 11th grade science class about how batteries work and that I really needed to keep them in the cold if possible. Also, there is the issue of the cement, the chemiclas from it will leach into your food products so you have to store everything up off the ground. This also goes for anything you are storing water/liquid in. Do not store your food or other products near gasoline, insecticides or other chemicals. 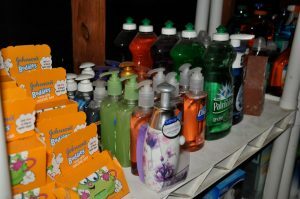 The plastic that these chemicals are stored in is porous and can leach into your food. These items should be in a separate cabinet on the other side of the garage. Although I do not keep food in my garage out in the open, I do have a refridgerator and chest freezer in my garage. 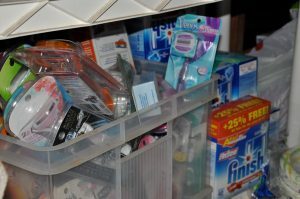 Food Storage Friday – Building a storage room. February 26, 2010 By tiffany 6 Comments By clicking on our links, we might make a SMALL commission - Thanks for the support! See our full DISCLOSURE here. My friend Clara and her husband built this awesome food storage room into their garage. I drug my husband over to show him so he would be as excited as I am about starting ours. I’ll let you know if it worked! Regardless, Clara and her husband did an amazing job and even cooler it really only took them about 9 hours the first day framing. Looking through this door, you had been looking into their garage, it was basically an outside door. Now they have a darling little entry way. This view, I am standing in the doorway of the new door to the garage. They did loose about 1/2 of their garage putting the room in. But here in TX we really don’t have many other methods of a full store room, unless you move a child out! Have I mentioned I would kill for a basement?! They put in a really nice pocket door to save on space. This is looking into her store room. They put down laminate flooring, you can not store any food storage directly on cement. Clara did hire out the drywall work which is well worth the money and time. They really know what they are doing and do it right. Clara’s awesome upright freezer and containers of wheat. They did a really nice job and it has honestly inspired my husband to help me get ours done. Both Clara and I are doing, and did theirs, in way that if we have to rip it out to sell the house we will be able to do it easily. As we get going on ours I will let you know of the cost involved. **The chemicals and moisture from the cement can ruin your food. Set the food on top of boards or some kind of barrier to prevent them from touching the cement. 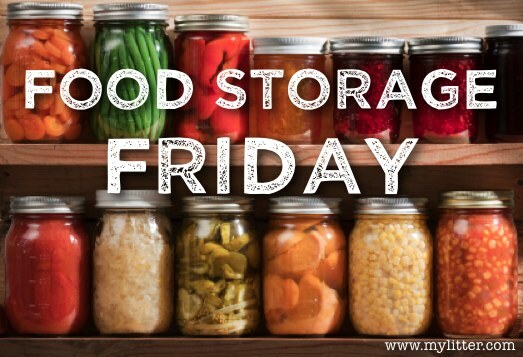 Food Storage Friday – Where to store it? February 12, 2010 By tiffany 1 Comment By clicking on our links, we might make a SMALL commission - Thanks for the support! See our full DISCLOSURE here. I am sure that all of us could complain about having the space for food storage. I am raising my hands right now shouting “me, me, that’s me!” When we first moved into our house 12 years aso, we had 1 child and almost no furniture. The 2,000 square feet seemed enormous and I never dreamed how I would fill up all those empty bedrooms 🙂 Now, we are crammed together and I dream all day of more square footage! Speaking of square footage, did you see the article about this guy who lives in an apt. in NY that is 178 square feet?? Finding the space for food storage can be very difficult, here in the south we do not have basements and the weather prevents you from safely storing any items in the garage. 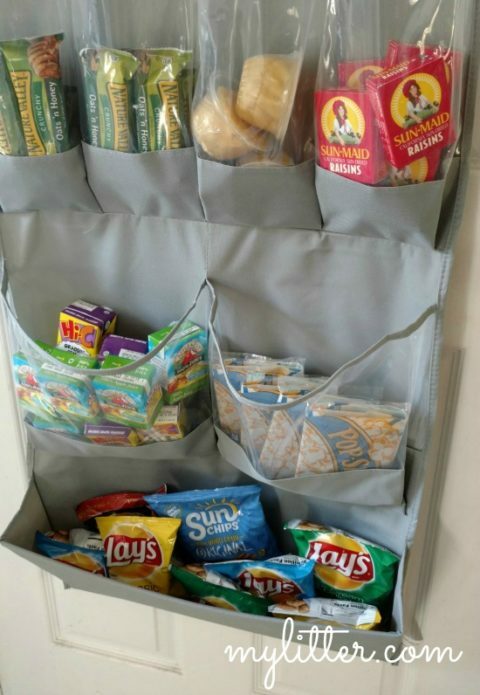 Plus, many storage items have specific ways in wich they have to be stored to maximize their freshness. I gave up many years ago that the idea of a coat closet is for coats, mine is my pantry, or that the space under beds is for boxes of fabulous shoes, ours houses 72 hour kits and more food storage, and that children’s closets were for hanging clothing, although they do have some clothes they also have stacks of #10 cans, boxes of MRE’s and bottled water. Taken from “Emergency Preparedness” this is a good guideline to remember. COOL – Store food inside. Temperature affects shelf life the most. Canned goods store 2 to 3 times longer at 70oF than they do at 90oF. Most dry goods store indefinitely below 70oF but for less time at higher temperatures. Temperature affects nutrition, texture, appearance and taste. DRY – Dry goods should be below 10% moisture and kept dry. The more a container is opened, the more moisture is introduced. The amount of humidity in the air during the time when you dry pack can also affect the storage life. Weevil cannot grow in grain with less than 10% moisture. Beans with less than 10% moisture won’t go hard as quickly. Non-fat dry milk should have no more than 2.8% moisture for the longest life. DARK – Store in opaque containers or in dark cupboards. Light fades colors, destroys vitamins, and speeds the rancidity of fats. AIRTIGHT – Containers should have airtight seams and lids. If in doubt, seal with duct tape. Plastic buckets with rubber gaskets are airtight if the gasket has not been damaged. Insects cannot grow and multiply without air. So where to put it…. 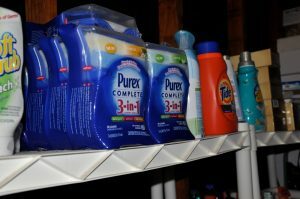 I personally use and love the Gorilla brand shelving units. I can usually find these at Sam’s Club for about $60, they are the best I have found. Under the beds we use rolling “sweater” storage drawers to keep cans and our 72 hour kits. My dream is to build out a room in my garage for my food storage. We got started last summer but didn’t get it finished, I am hoping to have it done by the time the heat gets here in a few months. It has to have an air conditioner and flooring as you can not store items directly on concrete. My good friend Clara just build a beautiful room in her garge that I am hoping to get a picture of to post for you 🙂 As we go along and get ours done I will post pictures and try and give you an idea of cost. Food Storage Friday – What dairy can you freeze? January 29, 2010 By tiffany 10 Comments By clicking on our links, we might make a SMALL commission - Thanks for the support! See our full DISCLOSURE here. I was planning a little different intro but due to the sales this week I am going to change it up a bit. ** When we start talking about how much to store for your family, I do NOT count the food in my freezer. It is too perishable. One of the best ways to save money and have some food storage is with a freezer. Now, in an emergency you have the possibility of loosing your freezer, so it does have its negatives. A freezer and the food in a freezer are my back up food storage. The most important food I have is that which will survive the heat and cold without help. During hurricane Ike we lost our large chest freezer. We had only a few days to eat the food from it before we had to toss EVERYTHING. I still have not replaced my large chest freezer. We have a full size fridge in my house and one in the garage. Both freezers are always FULL. I am good about rotating and using the food from both freezers, not as good though at rotating the things in my fridges! However, I really do wish I had my large freezer again for those really good meat deals. I also would keep many gallons of milk, ice cream, frozen dough, juice and bread to keep those last minute runs to the grocery store down. A full size chest freezer is well worth the money. A quick look at craigslist and I found many under $100. This will pay for itself in no time. The older units pull a lot of electricity, so keep that in mind and look for a newer model. Chest freezers are less expensive than upright freezers, obviously uprights are a little more convenient when looking for what you are storing! I label EVERYTHING that I put in the freezer with a permanent marker. I bribe a bigger kid to help me pull the bottom items up when I am loading a new shopping trip in ( when I had my chest freezer) now I do take the time to pull forward the older items to attempt to rotate it all. We pick blueberries in the summer and freeze 40 lbs at a time. It is important to remember when freezing fruit to NOT WASH it before you freeze if possible, and if you can flash freeze it first. ** The HIGER the fat content the better it freezes, above 40% is best. ~Butter can be frozen for 6 to 9 months in its original coated paper packages. Margarine will last for 12 months. ~Cream cheese, dry cottage cheese and farmer’s cheese can be kept in the freezer for three months. Avoid freezing creamed cottage cheese because it breaks down and gets mushy. ~Hard cheeses such as cheddar, Colby, Gouda, Swiss and Edam should be cut and wrapped in small pieces of less than one pound. If you use grated cheeses frequently, grate them first and then freeze in freezer-weight plastic bags or plastic freezer containers. Before using, thaw grated cheese in the refrigerator. ~Processed cheese like Velveeta can be frozen in a loaf or in slices for up to four months. Blue cheese freezes well for three months, but it will become crumbly after thawing. ~You can freeze light and heavy cream, evaporated milk and half-and-half for up to two months. Heavy cream may not whip up after thawing, however. 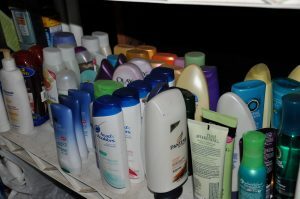 Don’t freeze these products in their original containers. Store in plastic freezer containers or glass jars. Leave one inch of headspace because the liquids will expand as they freeze and you don’t want a dairy explosion in the freezer. ~Milk will store in the freezer for one month, but make sure you leave expansion room in the container. ~Eggs can’t be frozen in their original state, but you can break the eggs and add one tablespoon of milk or water per egg and a dash of salt. Scramble them before you put them in a freezer container. Thaw in the refrigerator and use for scrambled eggs, pancakes, waffles or French toast. Do you use a freezer? Has it helped you save money? January 28, 2010 By tiffany 9 Comments By clicking on our links, we might make a SMALL commission - Thanks for the support! See our full DISCLOSURE here. 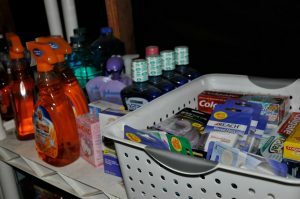 ~ What is food storage? ~ How to store it? ~ How much do I need for my/your size family? ~ How long does it last. ~ Where to store it. ~ How do I rotate my food? If there is anything that you would like some information on or if you have any thing to add or offer please leave a comment. Do you have a system that works for you that you can share with us? I would love to have some guest posts.